The distant continent of Tian Xia rests on the opposite side of the world from the Inner Sea region, and it shows. From the treacherous jungles of naga-ruled Nagajor to the sorcerous kingdom of Dtang Ma, and from the trackless and unforgiving deserts of Shaguang to the wondrous city of Goka, countless opportunities can be found for any character or adventure in amazingly expansive Tian Xia. While the extensive Dragon Empires Gazetteer unveils dozens of the mystical continent's secrets, the Dragon Empires Primer provides information pertinent to creating characters for campaigns set in this vast and diverse region. 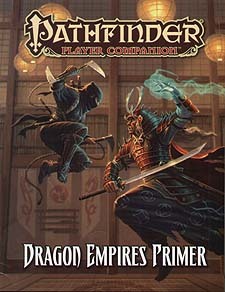 This volume of Pathfinder Player Companion provides players and Game Masters alike with all of the setting-specific traits and trappings they need to customize and play characters in the Dragon Empires. Overviews of all of Tian Xia's nations, including important details for players to integrate into their characters' histories and new character traits for every region to give characters boons that further tie them to their homelands. Rules for Tian Xia's five most prominent races: The shapeshifting kitsune, ophidian nagaji, transmigratory samsarans, avian tengus, and shadowy wayangs. Four new archetypes with distinctly Tian flavours, including the lotus geisha (bard), sword saint (samurai), white-haired witch (witch), and yokai hunter (ranger). New feats for combative characters that bolster prowess in martial arts and swordplay. An extensive look at the gods and philosophies of the Dragon Empires, as well as rules for the moon subdomain. A new bloodline for sorcerers tainted with oni blood, and a new school of magic for wizards who wish to harness the power of the mysterious void. New rules mechanics for establishing and maintaining one's honour in the Dragon Empires.